It's weird to be writing a eulogy for a pet who wasn't even mine, but P.C. was just that kind of cat. He showed up on day, about ten years ago, in the gutter across the street from my parents' house. Just lying there. I thought it looked odd so I walked out to the fence for a closer look. When I realized that the cat over there was alive and was headed my way across the street, I jogged over to check it out. What I found was a scrawny, dirty-white kitten, half Siamese and half tabby, and oozing from a puncture in his front leg. He was friendly, though, so I carried him back over to show my mom. She had been musing about getting a cat while her two dogs were still pups, but Hudson (a.k.a. the Gold-Plated Dog) had just been through his second surgery in as many months, and mom's predictable reaction was something about putting the vet's kids through Ivy League educations, so no--no cats. I looked at the purring trainwreck in my hands, and dug for the most manipulative cheap-shot I could come up with. "Okay, then, but I'd better take this guy to the pound so they can at least put him out of his misery, because he's not gonna last with his leg abscessed like it is." "Oh, just take him to the vet and have them bill me!" she groaned, exasperated. So I grabbed my car keys and bolted off before she could change her mind. The vet shaved the kitten's leg, managed to clean it out without debridement (which would have meant one more surgery on the bill), got the fleas off him, and sent him home within two hours. He sat on the seat next to me, purring all the way. Soon named P.C. by my mom (short for "Plain Cat," though he earned several less-printable nicknames over his tenure there), this little guy took a short look around my parents' house, declared it his kingdom, and never looked back. He remained on the small side, but put on weight as he developed into a stocky, muscular adult. As his fur filled in it provided the perfect contrast to the most dazzling blue eyes I'd ever seen on a cat. Dogs, people... he held everyone in his sway. Snickers and Hudson (my parents' Springer Spaniels), both over 55 pounds, were reduced to chew toys and wrestling partners. My own dog avoided eye contact most of the time, as he never quite knew what to do when a cat chased HIM. 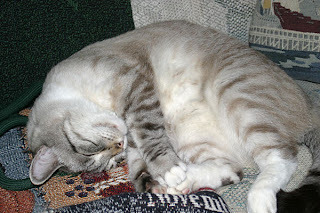 When visitors came over, they were greeted at the door and marveled at this gorgeous, outgoing cat who would turn into a ragdoll in your arms, craning his head backward for an upside-down look at the world. And even as I became more and more allergic to cats in recent years, I'd load up on antihistamines before I'd visit, knowing full well I wouldn't be able to resist petting, playing, or occasionally napping with their little bruiser. On December 26th, P.C. left us as abruptly he arrived. My mom noticed he hadn't been around for a while and went looking, finding him motionless on their bedroom floor. He hadn't been sick, hadn't been injured, and was only ten years old. I was stunned by my dad's phone call, and I'm sure it's going to be difficult when I go over next. While it's sad to lose P.C. so soon, though, I can't help but smile remembering how much fun it was to know him. Take care short cat... and wherever you are, don't bite the dogs in the face, okay? 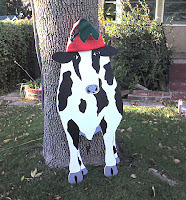 My only Christmas decoration this year--I like to keep it surreal. 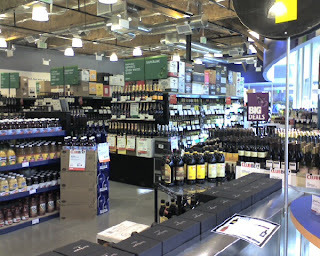 There is now a BevMo store in my neighborhood. $.25 wine tastings rock.